an upcoming comedy series Urban Myths. Pointing out the obvious disrespect to her late father, she was riled up by the skin colour issues that plagued Jackson for decades before his death. Paris was one of many who were upset by the casting of a white actor as Michael Jackson. The TV episode which made her angry was based on the claims by a Vanity Fair article that Michael Jackson, Elizabeth Taylor and Marlon Brando all drove out of New York by car following the September 11 attacks because all the airports were closed. Urban Myths they call it. After the trailer for the Jackson episode was released, Paris expressed her outrage via her Twitter account. Here's what she tweeted. “I’m so incredibly offended by it, as I’m sure plenty of people are as well, and it honestly makes me want to vomit.” She wrote. “It angers me to see how obviously intentional it was for them to be this insulting, not just towards by father, but my godmother Liz as well.” She continued. She feels the legacy of the late star should not be tainted by insinuating that he was white or hated being black. “Where is the respect?” And referred to Fiennes portrayal of her father as shameful. The actor was unremorsefull about his chosen role. 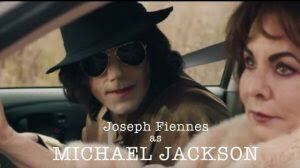 Fiennes had previously defended being cast as the king of pop, saying that Michael Jackson had an issue with his pigmentation and “was probably closer to my color than his original color. A little harsh probably, but there you have it. One of the twists of being a legend, is that your life continues to be lived by others and through others even after you're dead, and there isn't a thing you can do about it.